Modern science knows in intimate detail what DNA looks like and what it does. But because DNA is actually smaller than a single packet of light (a photon) - it is literally unseeable. So on the one hand these works are grounded in scientific realism, but on the other they are abstract to our reality due to scale involved. Making sculptures about these molecules means working in the abstract and in reality at the same time; in a sense, art can do what science cannot with these molecules, it can see them. This is a sketch for a single turn of DNA at a scale of about 1:170,000,000. 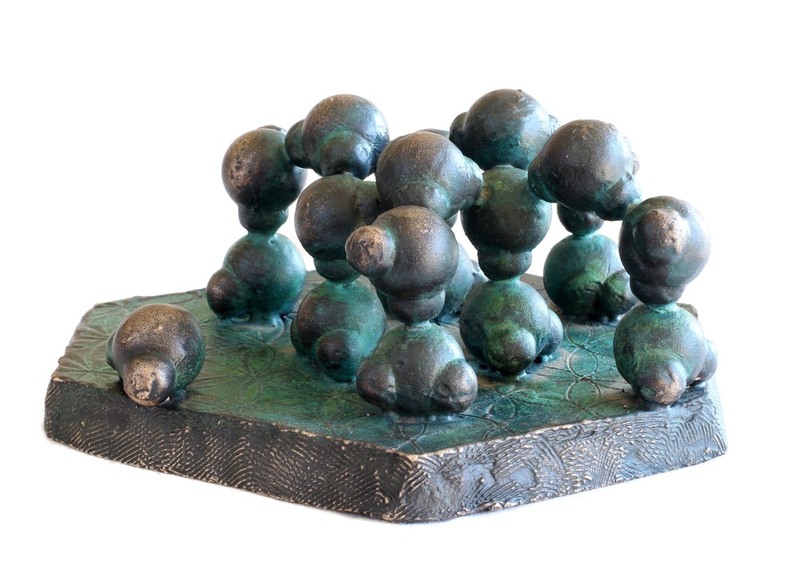 It is intended as a larger work, with the bases that constitute the molecular code and the phosphates that make up the double helix to be made from a combination of bronze and stainless steel in the larger versions. Whilst the geometry and science in this sketch is accurate, there is allot more research and work to be done before I make the larger finished works. I will never be able to look at a group of water molecules, aligned just before freezing. But if I could, this is what they might look like. I have spent allot of time imagining the worlds within that I am not privy to. Worlds that would be beautiful to see, and amazing to visit.